Crisp, feathery light, and with a delightful, mild tang, these waffles evoke memories of Goldrush days in California, when sourdough pancakes, biscuits, and bread were served to miners morning, noon, and night. This recipe also makes great pancakes. 42 mins. to 50 mins. 12 hrs 42 mins. to 12 hrs 50 mins. To make the overnight sponge, stir down your refrigerated starter, and remove 1 cup. Note: This is a good opportunity to feed the remainder, if necessary. In a large mixing bowl, stir together the 1 cup unfed starter, flour, sugar, and buttermilk. Cover and let rest at cool room temperature (about 65°F to 70°F) for about 12 hours, or overnight. Yield: 1 dozen 8" waffles or about 2 dozen medium pancakes. Want to make pancakes? 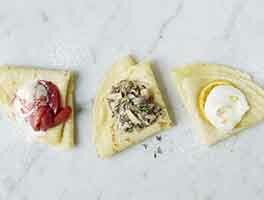 Simply cook the batter in rounds on a griddle, rather than in a waffle iron. 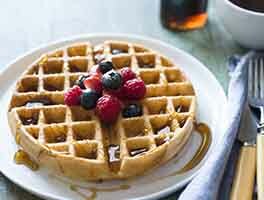 For whole-grain waffles, substitute our white whole wheat flour or Premium whole wheat flour for some or all of the all-purpose flour. 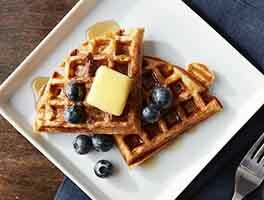 We love these waffles! I use butter, add in a little cinnamon and vanilla. I stick to waffles though, I don't seem to get fluffy pancakes with this one. These pancakes have got to be the best ones I've ever made. Even better if you throw some blueberries in. The only recipe I ever use for waffles. Good with syrup, jam or peanut butter. Freeze well for toaster waffles. I cook these in a 35 year old waffle iron. Just the best on a weekend morning! I made this from the discard of my starter. I just got a starter kit from KAF, so this is a new world for me. I was glad to see I could use my "discard" because I hate wastefulness. The waffles were easy to make, had a good flavor, the batter seemed thicker than my normal yeast waffle recipe, possibly because I made my own buttermilk with whole milk and lemon juice. (I do scale out all of my ingredients in grams) I added a bit of milk to compensate. I will make again. One question...per the recipe I added the discard to four sugar and buttermilk and let it set out overnight (well technically all day as we ate them for dinner) was that "feeding"? 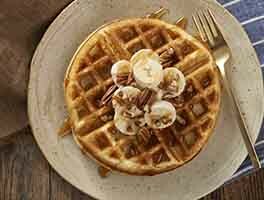 I have made this recipe several times now on two different waffle irons. I add a teaspoon of vanilla, a teaspoon of cinnamon and a tablespoon of honey to my mix. It seems crispier when I added the cinnamon. They are amazing. Crisp on the outside with a fluffy crumb inside. I have an old waffle iron but these are making me consider buying a new Belgium waffle maker. This is the second time I tried this recipe. The first time, I now think, my starter discard was not strong enough. This time, my starter was bubbling away. The waffles were marvelous! You are ruining me for going out to breakfast!!!!! I substituted a little - I only had 200 g of starter to spare so I made up the rest of the total amount with extra flour and water. And used milk with vinegar instead of buttermilk. Even with that they were lovely light pancakes, with a nice sourdough flavour. And with the sponge from the night before they came together quickly in the morning. Family review said they were at least as good, and maybe even better than the King Arthur "Simple but Perfect Pancake" recipe. Pancakes were delicious! It does make quite a few pancakes. I cooled and froze the left over pancakes. The dough seems a little gooey, but they turn out great! Good use of discarded starter. These are, by far, THE BEST pancakes I have ever had! They don't even need syrup or anything...they are that good! 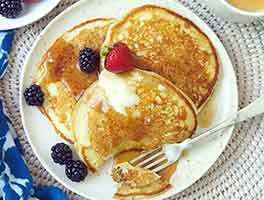 I use the KA 100% whole wheat flour, a mixture of vinegar/milk instead of buttermilk & the melted butter instead of the oil... absolutely delicious! !